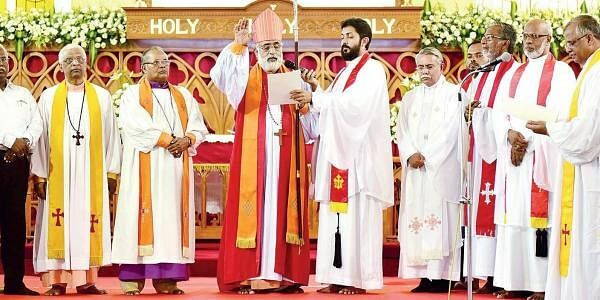 THE CSI Immanuel Church at Broadway was raised to the status of cathedral, the first under the Cochin Diocese, on Sunday. KOCHI: THE CSI Immanuel Church at Broadway was raised to the status of cathedral, the first under the Cochin Diocese, on Sunday. The dedication service of the elevation of the church - which completed 110 years of existence - was led by Church of South India moderator Bishop Thomas K Oommen. Chairman and Cochin Diocese Bishop Baker Ninan Fenn made the declaration in this regard considering the spiritual and social activities carried out by the church over the past several decades. The dedication service was followed by a public function chaired by Bishop Baker Ninan Fenn. A special memento was presented to Bishop Thomas K Oommen by Rev Jacob John, clergy secretary and general convener, at the function. In his inaugural address, Bishop Thomas K Oommen reiterated the need for religious harmony. Diocesan treasurer Rev P J Jacob offered the opening prayer, which was followed by the welcome address by Rev Jacob John. Bishop Baker Ninan Fenn delivered the presidential address. Rev V Prasada Rao, deputy moderator, CSI, and Bishop of Dornakkal Diocese; Rev Rathnakara Sadananda, general secretary, CSI; C Robert Bruce, treasurer, CSI; Rev K G Daniel, Bishop, CSI East Kerala Diocese; Rev P G Kuruvilla, retired Bishop, former CSI North Kerala Diocese; Rev Thomas Samuel, retired Bishop, CSI Madhya Kerala Diocese; Yuhanon Mor Meletius, Metropolitan, Malankara Orthodox Syrian Church, Thrissur; Rev Joseph Kalankad, Bishop of Roman Catholic Church, Fort Kochi; Swami Suendhara Nath, Nechima Ashram; K V Thomas MP and Hibi Eden MLA, among others offered felicitations. Abraham Simon, Diocesan Lay secretary, proposed a vote of thanks.